Q. How do I import a text file (.ris) into EndNote? Begin by opening EndNote Web through the library homepage and logging into your account. Once you have logged in click "COLLECT" on the menu bar and then click on the "IMPORT REFERENCES" link. Select the file you wish to import and then select the filter through the "IMPORT OPTION". This means selecting the database the record was retrieved from. Then click import. The example below shows that I have imported the an ".ris" file that was retrieved from a ProQuest database. Once you click "IMPORT" the file will be imported into the folder you selected. In the instance above, I chose "UNFILED". On the following screen, you will receive confirmation that the file has been imported. Click on the file name to view the new citation. Go into your finder window and locate and highlight the file. Instead of opening the files, click "FILE"-- and then "OPEN WITH" and then select "ENDNOTE" as the application. 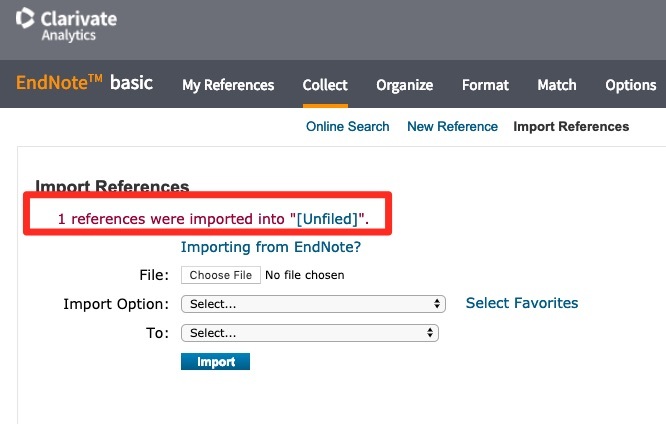 Doing this will ensure that the file is imported directly to EndNote.